In conjunction with its Christmas Magnificence campaign, world-class shopping destination, Pavilion Kuala Lumpur celebrated its annual Pavilion Junior Ball last weekend. 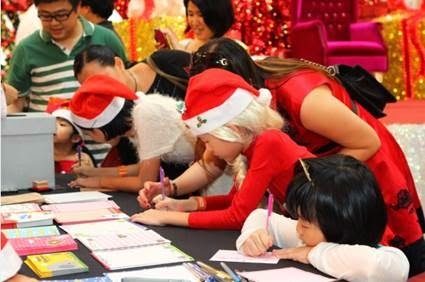 Over 100 Pavilion Junior members and their families attended the celebration at the mall's Centre Court, dressed to the nines in 'Santa' and 'Santarina' outfits. Pavilion Junior members posing happily with Santa Claus at the Pavilion Junior Ball. Pavilion Junior members were handed out activity sheets upon registration at Centre Court, where they were tasked to visit the five booths to earn activity stamps. The booths included a polaroid photo-taking station at the magnificent Christmas trees, a letter-writing station where children can hand-write letters to Santa Claus himself, an ice cream booth, a candy booth and a gift drop-off station where children can drop off gifts they brought for charity. Pavilion Junior members writing their letters to Santa Claus. 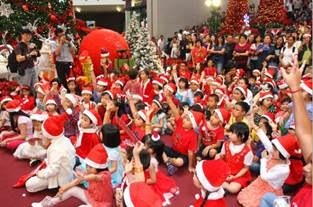 As Christmas is the season of giving, Pavilion Kuala Lumpur has chosen two charity homes, Home of Peace, a home for girls from underprivileged backgrounds and Agathians Shelter, a home that houses boys who have been abandoned or are from broken families as beneficiaries to the funds collected from the celebration. 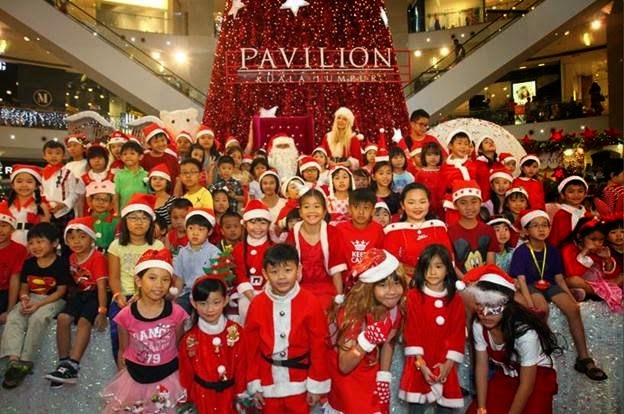 This included funds collected from the sale of Christmas packages at the Pavilion Junior Ball, which contained a Santa hat, one large candy cane and an assortment of shopping vouchers. Funds collected from 'Santa Meet and Greet sessions' and gifts brought in by the Pavilion Junior members were also channeled towards the charity organisations mentioned. The celebration also included a surprise visit by Santa Claus himself, who entertained the crowd with a Christmas quiz and distribution of presents. Local TV personality and singer, Mark O'Dea was also present to delight the crowd with his soothing tunes. 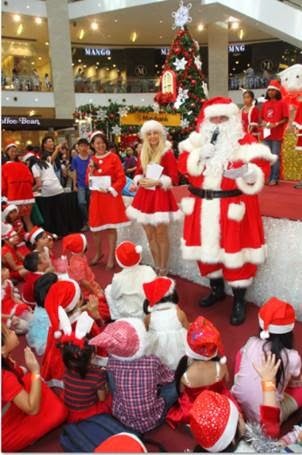 Santa Claus interacting with the Pavilion Junior members. 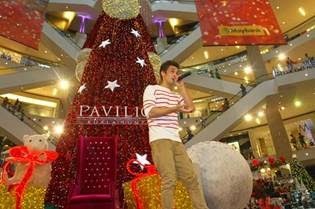 8TV personality, Mark O'Dea bringing cheer to the crowd with his Christmas singing. The children raised their hands enthusiastically when Santa posed the Christmas quiz. The child who answered correctly walked away with a pair of tickets to Sesame Street LIVE in Genting Highlands. 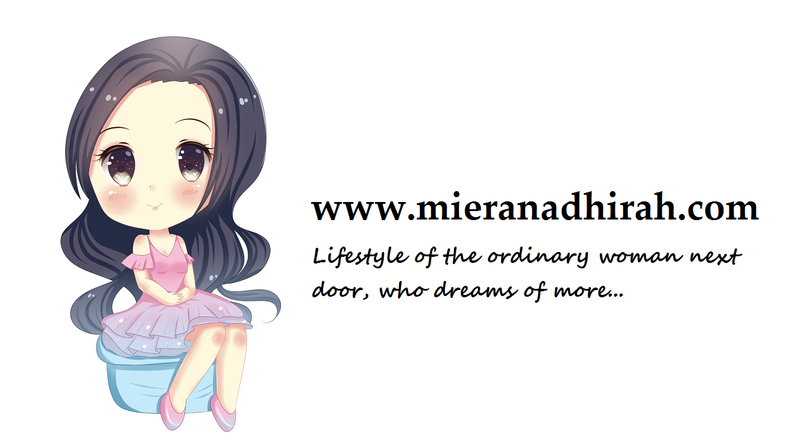 The event came to an exciting peak when an unexpected dance performance surprised the crowd. Children, shoppers, Pavilion KL staff joined in as the performers danced to Taylor Swift's 'Shake it Off' and 'All I Want for Christmas is You'. 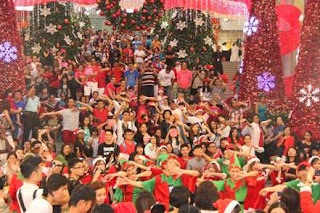 Children, shoppers and Pavilion KL staff joined in the catchy dance performance of Taylor Swift's 'Shake It Off' and Mariah Carey's 'All I Want For Christmas Is You'. Pavilion Junior members gleaming with joy as they posed as Best Dressed winners of the day. 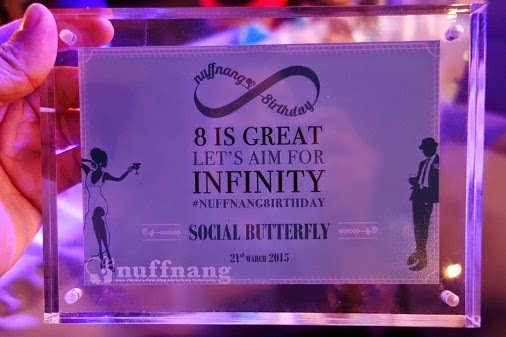 A total of 5 boys and 5 girls won the title, together with RM100 cash voucher from Guess Kids and a pair of tickets to Sesame Street LIVE in Genting Highlands, each. 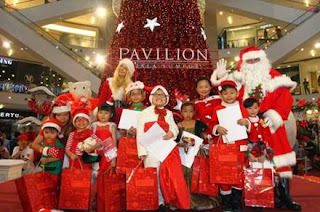 Shoppers can sign up for Pavilion Junior when they spend RM100 in a single receipt centre-wide. Pavilion Junior is open to children between 4 to 12 years old. 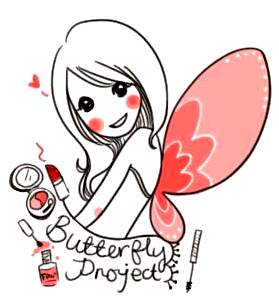 Registration can be done at Level 2, Concierge Desk, located at Porte Cochere entrance, from 10am to 10pm daily. 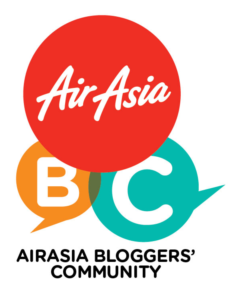 For more information, contact Pavilion Kuala Lumpur's Concierge at 03 2118-8833 or check real-time updates on Pavilion Kuala Lumpur's Facebook page http://www.facebook.com/PavilionKL, Twitter page at @Pavilion_KL or Instagram account @PavilionKualaLumpur.